Founded in 1891, Carnegie Hall presents more than 200 concerts a season on its three great stages—the renowned Isaac Stern Auditorium / Ronald O. Perelman Stage, intimate Weill Recital Hall, and innovative Zankel Hall. Bernstein famously made his conducting debut at the Hall in 1943, and went on to appear more than 430 times in a multitude of roles including conductor, pianist, composer, and educator. The New York Philharmonic is the oldest symphony orchestra in the United States, and one of the oldest in the world. Since its inception, the Orchestra has championed the new music of its time, from Dvořák to John Adams. In 1958, Leonard Bernstein became the first American-born and American-trained conductor to become music director of the orchestra—a post he filled until being named Lifetime-Laureate conductor in 1969. The Center for Jewish History is the home of five preeminent Jewish institutions dedicated to history, culture, and art. It unites under one roof collections that bring together centuries of Jewish life: the American Jewish Historical Society, the American Sephardi Federation, the Leo Baeck Institute, the Yeshiva University Museum, and the YIVO Institute for Jewish Research. The Liturgical Music Program at St. Ignatius Loyola Church provides musical support for over 400 liturgies a year, from its Solemn Mass with the professional Choir of St Ignatius Loyola to the informal Family Masses. The “Sacred Music in a Sacred Space” concert series, founded by Music Director Kent Tritle, is now going into its 20th season. Since its founding in 1904, the Jewish Museum has been a preeminent museum devoted to the scope and diversity of 4,000 years of art and Jewish culture. Beyond showcasing its renowned collection of more than 26,000 objects, the museum presents a wide array of educational and cultural programs and events. One of the world’s leading performing arts centers, Lincoln Center is home to 12 resident organizations, including the New York Philharmonic, the Metropolitan Opera, the New York City Ballet, the Julliard School, and Jazz at Lincoln Center. 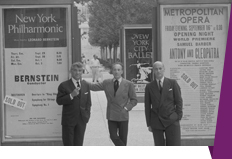 LincoIn Center opened in 1962 with Leonard Bernstein leading the New York Philharmonic in its inaugural concert at Philharmonic Hall (now Avery Fisher Hall). For more than 60 years, New York City Center has hosted some of the world’s most amazing performers. In addition to being the long-time home of the Manhattan Theater Club, they produce Broadway revivals to critical acclaim with the Encores!® Great American Musicals in Concert series, and introduce new audiences to the art of movement with the annual Fall for Dance festival. Leonard Bernstein led the New York City Symphony there as Music Director from 1945–1947. The Paley Center, with locations in New York and Los Angeles, leads the discussion about the cultural, creative, and social significance of television, radio, and emerging media. The general public can access the collection and participate in programs that explore and celebrate the creativity, innovations, personalities, and leaders who are shaping media. Thirteen/WNET is one of the key program providers for public television, bringing such acclaimed series as Great Performances, Nature, American Masters, and Charlie Rose to audiences nationwide, and serving the entire New York City metro area with unique local productions and broadcasts, cutting-edge web sites, and innovative educational and cultural projects. WNYC Radio is New York’s premier public radio station, comprising WNYC 93.9 FM and WNYC AM 820 and wnyc.org. Reaching more than 1.1 million listeners every week, WNYC FM and AM extend New York City’s cultural riches to the entire country and air the best national offerings from affiliate networks National Public Radio, Public Radio International, and American Public Media. WNYC 93.9 FM broadcasts a wide range of daily news, talk, cultural, and classical music programming, while WNYC AM 820 focuses on breaking news and international news reporting. WNYC2, the station’s online 24-hour classical music service, accessible at wnyc.org, streams 500 years of new music.